Cookie cereal kids ask their parents for. Second year Creative Brand Management students are required to complete a capstone project known as Independent Study. We find our own clients and complete a real project. I was lucky enough to work with General Mills & Cookie Crisp. An updated consumer profile + how and when to talk to them. A new position within the market. Define innovation and “imaging possibilities” for Cookie Crisp. Cookie Crisp hasn’t spent a significant amount of money on the brand in over 10 years. During that time, new competitors have entered the market and the cereal industry has undergone a lot of changes. Consumers are shifting their breakfast allegiance to items deemed as tastier, healthier, better- for-you, more nourishing, and/or more convenient than cereal. Breakfast cereal brands are responding to these shifts in consumer habits by positioning themselves as a healthy, on-the-go snack. Fast-Track Families: Families that lead busy, active lives often centered around their schedules and interests. These families used to always convene at the dinner table, but the traditional 6:00 family dinner is becoming increasingly hard to pull off. It doesn’t mean that family time isn’t still very important. Families are just having to find different times and new ways to be together. Linguistics expert Lyn Fogle found that you can take that time and place it at other times of the day and still reap the same benefits. Can’t have family dinner? Meet for a snack. Help Cookie Crisp regain their status as the cookie cereal kids ask their parents for and become the cereal parents want to share with their kids. Cookie Crisp is the anytime sweet snack that parents want to share with their kids. Make snack time more social. The snack you talk over. We know that your life is busy. You’re juggling multiple roles of professional and peacemaker, of teacher and therapist, of chauffeur and chef. Even your kids are busy, scheduled down to the very second, with classes and extracurriculars. Sitting down together for a meal seems impossible. And having an actual conversation? Forget about it. But, what about a snack? The little meals that are fast and functional. A place you can meet your family in the middle. The time to sit and savor the company, the conversation, and the taste, together. But you need something that everyone loves. And what does everyone love? Cookies and milk are a timeless snack. And Cookie Crisp is a snack for those with less time. Busy families spend a lot of time in the car–whether driving to work, soccer practice, or going to the grocery store. This billboard can remind people of Cookie Crisp on their commutes. Our goal was to help families utilize their time together in the best way possible, so we needed to help get families talking over their bowl of Cookie Crisp. The client wanted to leave the back of the box as is, so next best thing: cards for inside the box. These cards can range from games to conversation starters. Grocery shopping isn't the most exciting part of your day. Cookie Crisp can make this task a more fun with game coupons. While shopping, families can utilize the 30ish minutes they have together to play a game around the store. Milk is a crucial part of cookies and milk. This floor vinyl can remind shoppers that if they are planning to purchase milk they might as well pick up something that tastes great with it. The brand wanted to know how and when to interact with consumers. The answer: Cookie Crisp needs to meet consumers in their natural habitat– where they are already spending their time. Kids and teens say that their favorite YouTubers understand them better than their friends. They are looking to Youtube stars for advice from food to buy to how to ask out their crush. By placing Cookie Crisp in these Youtubers' videos we can get the brand in front of kids and teens alongside people they already trust. Parents are looking to influencers on social media for parenting advice. Not just any influencer, micro-influencers to be exact. Parents seem to trust the advice of these smaller influencers more. Their 10,000 to 100,000ish followers make their recommendations seem more real and less likely to be the result of a big paycheck. If Cookie Crisp wants to be considered a snack, we need to place the brand where consumers have snacking on their mind: the sweet snack aisle. This gives consumers who already love the brand another chance to love it as well as reconnect with consumers who may have stopped eating the cookie cereal. I drew inspiration from the idea of a cookie jar for the snack aisle packaging. The design plays off of the original packaging found in the cereal aisle with a doodle style twist. 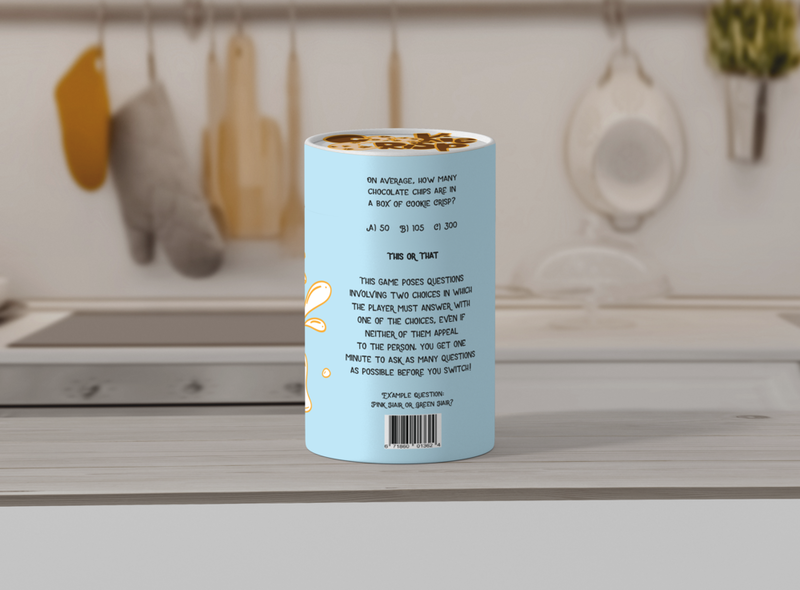 Games and questions similar to the cards in the cereal aisle box are found on the back of the container. But, I wanted to take it one step further. Part of the client's ask included defining innovation and "imaging possibilities" for the brand. They mentioned their admiration for brands such as Crayola and Lego; brands known for their commitment to the creativity of kids. How can Cookie Crisp begin to express their commitment to innovation? Through a partnership with Crayola. The colored packaging wrap can be peeled away to reveal a black and white version. Most importantly, this allows parents and kids to image their version of Chip the wolf or the color of their milk and cookies. On top of that, it is another activity to complete while enjoying their bowl of cookies and milk, together. It has been a while since the “Coo-oooooooooookie Crisp” howl rang through our television screens. The cookie cereal hasn’t spent a significant amount of money on the brand in nearly a decade. Breakfast has seen a decline. 31 million American adults don’t each breakfast. 77 percent of young children eat breakfast every day. 50 percent of middle age children eat breakfast every day. 36 percent of high school students eat breakfast every day. Even for those that do eat breakfast, it doesn’t look the same as it did 10 years ago. It is occurring in different places and with different foods. People are choosing to eat it outside of the home and that’s not likely to change. Consumers are shifting their breakfast allegiance to items deemed as tastier, healthier, better- for-you, more nourishing, and/or more convenient than cereal. Those two changes have caused big problems for the cereal industry. The cereal industry’s sales have dropped 17% between 2009 to 2017 ($12.7 B to $10.5 B). This downward trend is predicted to continue until at least 2020. The cereal industry’s answer to this shift in consumer eating habits has been to position cereal as a healthy, on-the-go snack. For example, General Mills' biggest competitor Kellogg’s has already begun the transition with its cereal brands. They boast about their vitamins and nutrients in brands from Krave to All-Bran. They made snackable options for their brands as well. 1) Snacking: Consumers see cereal as something to eat throughout the day, not just for breakfast. 2) Portability: Consumers expect their snacks to be on-the-go. 3) Health: Consumers are concerned about health and look to cereal as a healthy option. How does this affect Cookie Crisp? Snacking is a $374 billion worldwide industry. The United States alone spent over $750 million dollars on snacks in 2017. But, do cookies have a major role in snacking? Yes, yes they do. A Neilson study found that chocolate and cookies are within the top 5 snacks for Americans. Snacking has transformed the way we consume food. 91% of consumers snack multiple times throughout the day. Snacking now accounts for 50% of all eating occasions. Choosing just one snack is hard, which is why consumers don’t. They want variety. Households always have more than one snack on hand. Cookie Crisp had to realize they would never be the only snack food in the pantry. The pantry has mom’s snack, dad’s snack, kid’s snack, sweet snacks, salty snacks, on-the-go snacks… They work in a snack rotation. Currently, Cookie Crisp is talking to moms and kids. And with good reason. Moms direct most of the traffic. 70% of moms see themselves as the primary decision maker. They typically manage the research and the final decision on what to buy. Friends and family ask them for advice roughly nine times a month. 70% of young moms work outside of the home. Kids are more influential than ever. If they want something, they aren’t afraid to ask for it. Think about the power of the pester. Kids know what they want. 9 out of 10 parents report that their children demand things. Moms and kids are part of a larger unit: families. In order to understand moms and kids, we need to understand family dynamics, which have changed a lot in the last few years. The nuclear family is no more. Pretty much everyone agrees that the era of the nuclear family has declined to the point of no return. The big question is: What is replacing it? Now a new study suggests that nothing is — or rather, that a whole grab bag of family arrangements are. If you only target moms you are missing out. It's the idea of parents, kids, and families. Despite the changing family dynamics, the desire to spend more time together as a family hasn't changes. But, families have a lot going on. Parents are working, kids have schedules and activities. All of the schedules and activities make it difficult to schedule shared time together. Enter Fast-Track Families. Crave attention from their parents. Involved in sports, clubs, or other extracurricular activities. Insatiable curiosity and love making up new games to play with their family. Often find themselves working past the typical 9-5 hours. Searching for a work-life balance. Family is their main priority, but have trouble scheduling time together. View home as their family hub. I boiled my brand research down to 3 key findings. Finding: Cookie Crisp eaters love the cereal for its sweet taste. Implication: Health claims won’t work on them. Finding: Consumers enjoy their cookies and milk. Implication: Owning portability or convenience wouldn’t allow Cookie Crisp eaters to get their cookies and milk fix. Finding: Consumers eat Cookie Crisp at all times of the day, not just for breakfast. Implication: Cookie Crisp can be enjoyed at any time. Comparing these findings to the trends of the industry (shown above in competitive landscape), we see that Cookie Crisp eaters hold Cookie Crisp to different standards than other cereal brands. The new consumer and the three brand findings lead me to position Cookie Crisp as the anytime sweet snack that parents want to share with their kids. We are talking to consumers who need help utilizing any time they have together and who enjoy a sweet snack they can eat anytime throughout the day. Finding new, fun ways to spend quality time together is crucial to Fast-Track Families. Snack time allows these busy families to get everyone at home, whether at the kitchen table or on the sofa, to spend whatever time they have together. It isn't just about having everyone at home. It is about making the time they have at home quality time. It is about making it more social. Cookie Crisp, the snack you talk over. Cookie crisp isn’t asking you to change your lifestyle. They aren’t saying they can make your life less hectic. Who is to say that busy is always bad? What they are saying is, they get it. They know that just because your family has a lot going on doesn’t mean time together is any less important. It's just harder to come by. But, when you find an hour or even 10 mins anytime in the day to snack, Cookie Crisp is there to help you utilize that time the right way over a snack everyone loves! Cookies and Milk. Something sweet to share. I got some help from Naomi Bradley-Jean (XD), Tony Jorgensen (CW), and Joe Jones (AD).